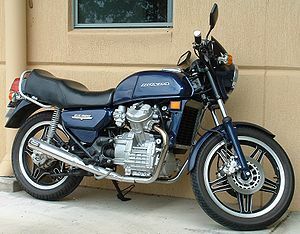 The Honda CX series motorcycles, including the GL500 and GL650 variants (due to engine similarity), were developed and released by Honda in the late 1970s, with production ending in most markets by the mid 1980s. The design included innovative features and technologies that were uncommon or unused at the time such as liquid cooling, electric-only starting, low-maintenance shaft drive, modular wheels, and dual CV-type carburetors that were tuned for reduced emissions. The electronic ignition system was separated from the rest of the electrical system, enabling the motorcycle to be push-started and ridden in case of a total electrical system failure. An innovative design places the crankshaft above the transmission, with both in the same housing. This keeps the engine short but quite tall. The styling was radical, upright forks and a short engine contributed to a stubby wheelbase on a bike that was rather tall. The CX500 was one of the first recipients of Honda's new Comstar wheels (and later, on B models, reverse comstar and a square brake fluid reservoir), which measured 19inch in front and 18inch at the back. Introduced in 1982 the EC variant is a much improved motorcycle compared to the original 500. Sharing many parts with the CX500 Turbo introduced the same model year, the Eurosport features air assisted front forks with anti-dive mechanism and air assisted prolink single shock rear suspension. The wheels are also modified, with an 18 inch diameter restyled round hole comstar front with a 100–90H18 tyre, whilst on the rear is a 120–80H18 tyre. The brakes are vastly improved with much more effective twin pot calipers on the front and a new disc brake with twin pot caliper on the rear replacing the original drum. The Eurosport is also significantly restyled with a larger fuel tank, a nose fairing, side panels, seat, and tail unit that share much more modern lines. In the UK only two colour options were made: white metallic with blue and red striping, or black with orange and silver stripes. The instrumentation is improved with the introduction of a fuel gauge and like the rest of the bike a much updated appearance. Plastic mudguards replace the chromed steel versions on the earlier machines curing the associated rust problems. The round headlight of the early bikes is also replaced with a rectangular lens which gives improved night lighting. The "Deluxe" model appeared in 1979. This bike looked nearly identical to the original CX500 Standard, with the exception of regular (85mph) gauges and headlight (the mini fairing was removed) and black reversed Com Star wheels - 19 inch front and 16 inch rear. 1981 was the final year for the CX500 Deluxe model. In 1983, the engine of the CX500 Turbo was bumped up to 673 cc which meant an increase from 77 to 97 horsepower, making it one of the more powerful motorcycles available that year. In addition to the increase in displacement, the compression ratio was increased while the maximum boost pressure was lowered, making for a less abrupt transition from off-boost to on-boost than was present in the earlier CX500 Turbo. The fuel-injection control system was substantially revised for the CX650 Turbo, and the rear shock received an update as well by adding a manually operated damping control mechanism. Cosmetically, the CX650 Turbo differs from its predecessor primarily in color and badging. However, in a cost cutting exercise, Honda manufactured the 650 Turbo fairing from ABS plastic as opposed to the 500 turbo's Glass-reinforced plastic. It is one of the rarest production Hondas ever, with only 1,777 built and fewer than 1,200 imported to the U.S. and Canada. The rest were distributed around the world but not sold in the Australian market. The CX series motorcycle has had an influence on the design of Honda's successful ST1100 and ST1300 Pan European models. These also feature longitudinal, or "flying V" engines and shaft drive, although they have four cylinders, fairings and luggage. Early influence for the CX engine design is believed to have come from the Marusho Lilac motorcycle where it is rumored that engineers went to work for Honda when Marusho finally went bankrupt in 1967. ↑ Honda Motorcycles - A Five Decade Journey. Retrieved on 2007-08-31. ↑ Moto Guzzi V50 Monza review. BikePoint. Retrieved on 2007-08-31. ↑ 1978-1982 Honda CX500. Motorcycle Classics (March/April 2008). Retrieved on 2009-02-25. ↑ Margie Siegal (May/June 2009). 1983 Honda CX650T. Motorcycle Classics. Retrieved on 2009-08-04. Pages in category "Honda CX series"
This page was last edited on 24 November 2010, at 16:10.